On the evening of March 15, 2018, Prof. Song Xiaoxia from CAFA delivered a lecture entitled “Xu Beihong and the Road of Modern Chinese Fine Arts in the 20th Century” at the Auditorium of the CAFA Art Museum, and it was presided over by Associate Professor Guo Hongmei, Director of Theoretical Publishing Department at CAFA Art Museum. It was the second round of the series of lectures for the “Celebration of the Centennial of Central Academy of Fine Arts: Xu Beihong–Living Art Forever”. 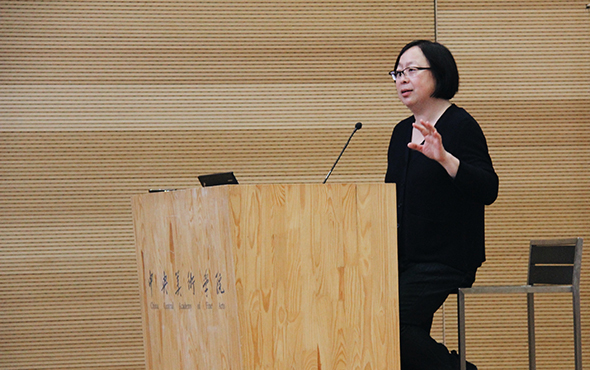 In the lecture, Prof. Song Xiaoxia was rethinking on Xu Beihong’s artistic thoughts and historical concepts, that reflect on the direct relationship between modern Chinese “realism” and our own society and reality. At the beginning of the lecture, Prof. Song Xiaoxia pointed out that we should not simply and repeatedly have value judgments when studying Xu Beihong and his art any more, but it was necessary to strive to restore the true and lively image in the historical scene with a centennial vision, and it should seek a new direction which has been ignored for a long time at the level of art noumenon. How was Xu Beihong’s improvement plan for Chinese painting generated? What was the problem that the plan designed to solve at that time? What kind of situation and context was it in? Perhaps there are issues that we need to more systematically consider today. In order to more effectively present the problem consciousness in the context of the era of Xu Beihong, Prof. Song Xiaoxia started from literature and art, and introduced the modern ideas of Chinese literature and art of Hu Shi, Chen Shizeng, and Chen Duxiu, to build the scene of Chinese culture in the early 20th century with a series of clues. In the analysis, Prof. Song Xiaoxia considered “take” and “give up” as the key words to specifically explain the choices, gains and losses of Hu Shi and others, when they were facing the different cultural resources of ancient and contemporary art, Chinese and Western cultures, as well as the judging method reflected in between “take and give up”. At the same time, Prof. Song Xiaoxia emphasized that the analysis of their options and modern approaches was not a judgment of the merits of their results, but considered the perception of their inner issues as a beginning of modern China, by which it is possible to feel their understanding of the history, namely the view of history. Later, Song Xiaoxia also quoted the evaluation of Michael Sullivan, the outsider and witness of this period of history. On the one hand, Sullivan saw the influence of Western thoughts on the cultural changes in China and the close interaction between Chinese literature and fine arts. On the other hand, he also clearly pointed out that the movement was “indeed a Chinese movement”, “purely expressing the true feelings of Chinese people”. 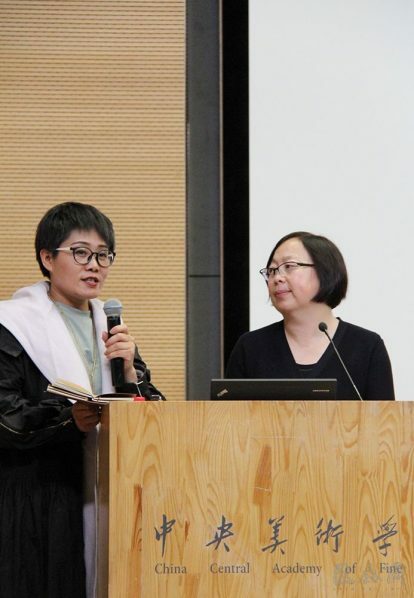 Prof. Song Xiaoxia believed that this “true feeling” was exactly the ideological premise and common ground for Chinese culture to offer different choices and plans in the process of pursuing modernity in the 20th century. Prof. Song Xiaoxia then focused on examining the modern road that Xu Beihong had explored in this context and analyzed its intrinsic meaning. On the one hand, Xu Beihong pursued the path of modern Chinese art with the modern core value of “science”, and expanded the social efficiency of the art with a solid & accurate visual image. On the other hand, Xu Beihong’s improvement plan of “using the realism form of European painting” also echoed his judgment on the inadequacies of Chinese traditional art and opened a road for Chinese art to return to the real world. The latter originated in Kang Youwei’s idea of political reform one hundred years ago, reflecting Xu Beihong’s thought thread and recognition prerequisite. In order to more specifically present Xu Beihong’s modern consciousness in artistic exploration, Prof. Song Xiaoxia showed Xu Beihong’s oil paintings with a strong oriental implication created during his stay in France. It explained that Xu Beihong didn’t only work hard during his study abroad, but also had a clear “self-regard” consciousness at the beginning. In this process, learning was only a medium, and the purpose was to complete or pursue the creation of modern Chinese art. The use of European scientific styling methods to innovate traditional brushstrokes was Xu Beihong’s ideal method to improve Chinese painting. In other words, Xu Beihong preferred to preserve the form of brush and ink, when he was faced with the question of the choices between ancient and modern, but also introduced science as the core method for the road of innovation in brush and ink. Prof. Song Xiaoxia took the ink painting of “Jiufanggao” created by Xu Beihong in 1931 and the well-known image of galloping horses as examples, and briefly analyzed Xu Beihong’s ideas for improvement from the perspective of art noumenon. First of all, Xu Beihong not only simply blended the sketching in the Chinese painting, but also presented them in ink and wash. However, his brushstrokes have been blended in and absorbed the shaping consciousness of drawing. In a sense, he has transformed the drawing into the brush and ink; secondly, although Xu Beihong’s brush and ink is featured in the form of traditional ink and wash, in order to follow the contours of objects and the need for shape and texture, the expression of ink and wash itself is weakened to obey the need for performance of the object’s structure and the overall need for spatial perspective. Objectively speaking, Xu Beihong’s ink paintings have weakened the aesthetic implication of traditional literati painting, while it also created a new sense of beauty at the same time. It was a new style for Chinese people of the 20th century. It also included and even created new value and development momentum. This exploration undoubtedly departed from the long-established and deeply entrenched value choices in Chinese traditional culture, while it also rebuilt the secular spirit of Chinese paintings, reflecting the attitude of modern Chinese painters, and embodying the new method of the painter’s understanding and observation of the world. 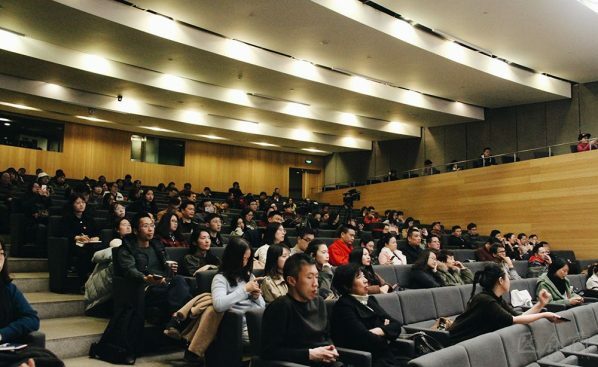 This lecture offered an interpretation of Xu Beihong from the art noumenon and presented Xu Beihong’s choices in the context of the modern transformation of fine arts in the 20th century from an objective and sober perspective. At the end of the lecture, Prof. Song Xiaoxia presented a conclusion that we were fully qualified to make an objective and in-depth analysis of the modernity proposition of Chinese culture after a hundred years. Thanks to this exhibition, we have the opportunity to see a large number of works by Xu Beihong, which have been systematically researched, many of which are presented in ink and color or ink and wash, although this work is not like his major thematic creations with a clear social orientation, it presented a subtle spiritual world and a personal artistic appearance of Xu Beihong. Centered on the content of this speech, the audience enthusiastically asked questions, interacted and exchanged with the speaker on the topics of “The Interchanging and Rethinking of the Perspectives of Chinese and Western Art in the 20th Century”, “The View of Linear Development of the Modern Chinese Art Road”, and “Xu Beihong and the Overseas Students Groups in the Modern Age”.